Update: as of the 26th June, The N1 is now available (although a limited number) through Vodafone Australia on a $79 per month contract for 2 years. IMHO, its still a better deal buying directly through Google (while the store is still open). The Google "Nexus One" phone manufactured by HTC, which made its debut earlier this month, is currently, the most advanced smart phone on the market. Running Android 2.1 the latest version of Google's mobile OS, with a 1 GHz processor, and a high resolution capacitive touch screen, means this phone met (and exceeded) all high end requirements a smart phone should. During Google's Nexus One announcement, it was revealed that the phone was available right now! And could be purchased by visiting google.com/phone provided you lived in the USA, UK, Singapore, or Hong Kong. What about the rest of the world? We got... "Sorry, the Nexus One phone is not available in your country" Arrrgh. Google say it will be available to other Countries (including Australia) in the coming months. For those of you, like me, who don't want to wait several months for the latest and greatest piece of tech to arrive in Australia, (Which by then, will be considered old news to the rest of the world). 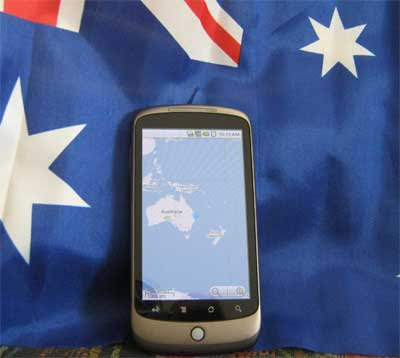 I have put together a step by step guide to buying a Google Nexus One in Australia (or any other country they are not available). This is the method I used to successfully purchase mine. Ok, please bear in mind, that you need to have a Google checkout account in order to purchase the phone, A few people have noted that during this process they have had their checkout accounts temporally suspended until they provided ID to Google (Drivers license, utility bill in their name and address etc) to verify they are who they say they are. (In an attempt to curb online CC fraud). Your going to need an account with Google to use checkout, so if you haven't already, I would recommend getting yourself a free Gmail account by visiting mail.google.com and clicking on "Create an account"
Once you have that account set up, you can now use that same account to sign up for more free Google products. Now open a Google checkout account by visiting "checkout.google.com" and enter all required information. Note: Make sure the billing address you specify is the same address your bank statements are sent to, it "may" also help if your default shipping address is the same as your billing address. Also add your Australian phone number. Some people have randomly been phoned by Google to verify that they did place the order. So make sure it is one you can be reached on easily. Now you need to get yourself an American mailing address that you can get mail delivered to. I used ComGateway which is free to join. Comgateway give you an address and phone number in Portland Oregon which also means you do not have to pay any extra taxes required by other states. They assign you a unique suite number to distinguish your address from someone else’s. Once you have that address, you need to add it as a "second" shipping address to your checkout account. When I added my Comgateway address to my Google checkout account, I logged into checkout, clicked "Edit shipping addresses", and then added the comgateway address to the form on the right hand side. I used my name (The same name I use for all my Google accounts) and the American address and phone number Comgateway supplied. I unchecked "Make this my default shipping address" and saved it. So I now have two shipping addresses in checkout. My default Australian address and the American address provided by Comgateway. So now you are set to order your phone. At the moment, you can access the URL google.com/phone, but you will get the message "Sorry, the Nexus One phone is not available in your country". Google display this message to anyone visiting with an IP address that is not located in the one of the countries the N1 is available. (Currently you can avoid the need for a proxy by using this link google.com/phone/?hl=en&gl=US&s7e. Not sure how long this loophole will remain open). If the above loophole fails, you need to visit that page using an American IP address. To do that, download and install Hotspot Shield from hotspotshield.com (it's free). Once that is installed, turn it on and test it by visiting whatsmyip.org. It should indicate you are located somewhere in the USA. If it does, it means you can now go ahead and order your phone. Note: Although HotSpotShield is a widely used and trusted program, I still don't like using any proxy to log into any sites, some bad untrustworthy proxies can be used to harvest user name and passwords. I would recommend changing your Google password before using HotSpotShield, then once you have finished using it, uninstall HotSpotShield from your computer and change your password back to what it was previously or something else... Just to be safe. Where there once was a "sorry" message, you should now see a purchase a Nexus One phone button. Go through the steps of purchasing your Nexus One phone. Specify your Australian address for Billing. When you get to the "shipping address" part of the process, your default (Australian) shipping address will automatically be entered into the form, prompting another sorry message about not being able to ship it to your Country. "We do not ship T-Mobile service plans outside the United States. If you wish to continue with your service plan purchase, specify a shipping address within the United States. If you wish to purchase a Nexus One phone without a service plan, you may specify a shipping address in Canada, Hong Kong, Singapore, the United Kingdom, or the United States." Just click "continue with purchase" and/or "Edit shipping details" (Can't remember exactly what the link says, but it is something like that). Then choose your American address from the list. Continue through the order process. All going well, within 24 hours after placing your order, your phone will be on its way to your address in Portland Oregon. Once it has arrived and been processed at Comgateway, you will receive an email notification that you have mail (this can take anywhere from a few hours to a few days... but usually within 24 hours). Log in to your Comgateway account and get them to forward your mail to your Australian address. Express shipping from Portland Oregon to Australia costs around $50 US dollars, some people say that priority shipping (which is around $30 US dollars) is just as quick. I ordered my Nexus One on Monday the 18th of January, and received it on Monday the 25th of January. So all up the whole process from order to delivery took one week and cost around $650 AU dollars. From the above instructions, it may sound like a major hassle to do, but it is really quite straight forward. Considering lesser HTC unlocked phones (Like the HTC Dream) sell for up to AU$1200 dollars here. IMHO AU$650 (Depending on the currency exchange rate) for an unlocked Nexus One phone delivered to your door, is a great price. Update: As of this morning (3rd Feb Australian time), less than a month after the phone went on sale, the first "over the air" (OTA) update for the Nexus One has been announced, The update should be available to all Nexus One owners by the end of this week. The update is said to fix 3G reception issues as well as enable multi touch to the default browser, maps and the gallery. Because I am impatient I "Manually" updated mine this morning and can confirm that multi touch - pinch to zoom now works on the Google Nexus One phone. The touchscreen keyboard also shows signs of multi touch with this update and overall the keyboard seems faster and easier to use. I will post my thoughts and opinions on the phone as well as a leather Nexus One case I got from Nutshell (AKA Tuff-as-nuts) soon. Update: 17 March 2010. Google have just announced that a version of the phone that is compatible with AT&T's network in the US and the Rogers network in Canada is now available for purchase through the Google store. These networks use the same frequency as Telstra's NextG network. So if you have been waiting for a 'NextG' compatible version of the Nexus One, then your wait is over. "Compatible with 3G on AT&T (U.s) and Rogers Wireless (Canada)"
Google have also said they will now ship the Nexus One directly to Canada. So the Canadians do not have to use any of the trickery we still have to. (for now at least). Now the N1 is being offered to more countries and supports all of the major frequencies, I would expect Google to start opening the store and shipping directly to other countries such as Australia very shortly. Until they do, the trickery will continue. Buying directly from Google is the only way to purchase an N1 at the moment. Either on contract with T-Mobile (which is not viable here in Australia), or unlocked. They have set a very competitive and reasonable price for an unlocked phone of this quality. Please beware of anyone offering a Nexus One phone at a cheaper price than Google can (Like the spam/scam comment I just deleted). Unfortunately whenever there is a demand for something of value, scammers come out of the woodwork. Easy to follow guide. Thanks, will order mine this week. No worries, If you get stuck or have any other questions, just ask. Hey and does Nexus one work on 3 mobile australia. What network are u using with urs. Yes it works fine on 3, no problems at all. I use Vodafone on the $49 cap. When I am at home, the phones built in WiFi modem automatically connects to my wireless modem. WiFi data is given priority, so when its available, all data syncing, web surfing, downloading etc is done over WiFI and does not use up your mobile data plan. The only frequency the Nexus one doesn't connect to is Tel$tra's "NextG", it works on Telstra 2G and 3G fine, just not NextG, All other providers are fully supported. Sorry it's very later from the post date. but does nexus one work with 3? or any other service providers? in that i am asking not just calling function, but date/internet packs? Hi, yes it does work on 3, I believe 3 roams to the Telstra network when they can't provide coverage, so you may want to consider the 850Mhz one. The N1 will work on all networks in Australia, just make sure you get the one that best suits you telco EG: 850 Mhz for Telstra or anyone that roams onto Telstra's network... and 900 Mhz for everyone else. hi, i just got a google nexus one. and i am with 3. how can i connect with internet and access data? Try setting your apn to the following. Everything else left as is. If you have any trouble let me know. I tired the one's you told and it gave a error. but there are some missing fields. Can i on Android or Nexus one, let wi-fi be default, but if nothing available download from 3G? If there are no wi-fi available, connect through 3G? Yes, when your connected to wifi, it becomes the default access point. If no wifi is available, it will use 3G. I have been reading that the nexus one is quite an unstable phone, though i still want one, I was just wondering whether the rumors were true of it collecting dust very easily within the screen, and whether the nexus one screen was prone to cracking when just put in a tight pair of jeans. Since youve owned a nexus one for around 9 weeks now, I would just like your 2cents regarding that info! Cheers! It seems stable enough to me, in fact it seems rock solid. Although I have had the odd app stop responding and need to be force closed a couple of times, but I think that's more to do with dodgy apps rather than the phone. I try to only install apps that have a good rating now (4 or above) and that seems to have done the trick. Also, whenever I install a new app or update one, I restart the phone. I've heard a few people have had issues with touch being "misaligned" (when touching "g" on the keyboard, "d" is typed instead), but I've never experienced it. It may have been a hardware/software issue in some of the first ones made, not sure. I personally have had no issues with dust at all, but I have heard about it, I believe it had something to do with the screens not being sealed or stuck down properly when the phone was first released. I don't think it affected too many units and I believe that those that were affected, were replaced under warranty. It was probably just teething problems with a few of the first lot that were manufactured, bad news seems to travel faster and further than good news. As for the screen being prone to cracking, I do recall reading a story about someone "claiming" that their screen cracked while it was just "sitting on the desk", but I took that claim with a grain of salt. I've dropped mine a few of times (admittedly while it was in its leather case) and the phones still fine. I don't use a screen protector or anything on it and its still looks like the day I got it. Even though the screen is glass, I doubt it would break from just having it in the pocket of a tight pair of jeans, unless maybe it was in your back pocket and you sat down on a jagged rock or something. This video may interest you. So to cap it off, I've had none of the issues you mentioned and I'm pretty sure the majority of N1 owners haven't either. Hi, so if im on three will the 850 MHz be the best one or the 900 MHz be the one for me? At the moment I beleive Three roam to the Telstra NextG network so the 850 MHz one would be best. But that may not always be the case, three and Vodafone as I understand, have merged, so they may start roaming to Vodafone sometime in the future. You should probably ask Three directly and see if they can give a time frame of if/when they will start to use Vodafone. From what I have seen on some forums. it seems that 3 ahve a contract with Telstra for some time, so I believe ill be getting the 850 MHZ version. Btw is the coverage the same for the N1 as it is with any previous phone you owned on 3? ie. you get full reception where ever you use to get it. I'm actually on vodafone. But the reception on the N1 has been about the same as it was on my other phone's. Well, I haven't noticed any difference anyway. Does an engraved phone mean that the warrenty is gone or jst the refund?? Also y do google need a billing address that is the same address your bank statements are sent to? No it does not void the warranty. From Google's nexus one support site. Device swap (currently only available in the US): The device swap is the quickest way to get a working phone again. A way to get a working phone again. A replacement device will be sent to you, together with a box for returning the defective device. together with a box for returning the defective device. You should remove the SIM card, the battery, and the microSD card from the defective device, and return the defective phone n the box provided If you have engraved your phone with a personal message, the device that you receive will not include the engraving and the engraving on the defective device will not be sent back to you. If you want to keep your engraving, you device will not be sent back to you. If you want to keep your engraving, you can opt for the express repair option. So basically, if you want to keep the engraving, you will need to send it back for repair. About the billing address. That's not a requirement, but may help speed the ordering process up. By that I mean, Google sometimes block checkout accounts until proof is provided to confirm you are who you say you are (licence, bank statement etc). Also. I misread your first question. Getting the engraving does mean you will not be able to return the phone for a refund if you decided you didn't like the phone or changed your mind etc. But does not affect your warranty. Does anyone know how to set up wallpapers? I mean i downloaded a picture which says it is a wallpaper for nexus. then i tried to set as wallpaper, but it asks to crop it. and you can't select the whole picture. so only a part of the picture can be selected and set as wallpaper. Even if i take a picture through camera, i cant set as wallpaper. it asks to crop it. Do you know how to set wallpaper without cropping or atleast select the whole picture? Because the wallpaper moves in the background when you slide through the screens, the wallpaper needs to be a certain aspect ratio (which I can't remember off hand). The ones already on the Nexus one, are obviously already optimized. When adding your own, you either have to crop to the right aspect ratio, or if its already set to the right aspect, you also get to choose which parts of the picture you want to be shown in the wallpaper. That's where the cropping comes in. If the image is in the right aspect ratio, and you want to use the whole image, just touch an edge or line of the cropping marks and drag it outwards, the other edges will also move to keep the right AR. Likewise, if you want to leave out part of the picture, re size the crop marks and move them around the picture till your happy. When you have it the way you like it, choose set as wallpaper! From the Nexus One user guide. 1 Press Menu and touch Wallpaper. 2 Touch Live wallpaper, Photographs, or Wallpaper gallery. wallpapers have a Settings button. the samples. Touch a sample to view a larger version. 3 Touch Save or Set wallpaper. pictures that are on your microSD card. 1 Touch a picture to view the controls and touch Menu. The cropping rectangle appears on top of the picture. 4 Use the cropping tool to select the portion of the picture to crop. Drag from the inside of the cropping tool to move it. Drag an edge of the cropping tool to resize it to any proportion. Drag a corner of the cropping tool to resize it with fixed proportions. Touch Save to save a copy of the picture as you cropped it. The original uncropped version remains on your microSD card. I want the whole picture to show as wallpaper, not part of it. is there a way to do it? I downloaded a picture from website which says it's a wallpaper for nexus. but still the rectangle does not select the whole picture, and i can't select it. So there is no way to select the whole picture? If you can't get the whole image selected using the cropping tool, then I would assume that the image is not in the right aspect ratio/dimension/resolution. After Googling the Nexus one's wallpaper size, I found that apparently the resolution of the image should be 960x800. So I just cropped an image in photoshop to 960 wide by 800 high and added it to the SD card of my N1, I opened the image using the Nexus One's gallery and set it as the wallpaper. When it came to cropping the image, I was able to drag the cropping tool so that the entire image was used as the wallpaper. So to conclude, if you find that you are unable to use the whole image, I can only assume that the image you are using is not in the correct dimensions (just check it to make sure). If it is not, use your favorite image editor to resize it. How do you chrage the N1 via the wall charger? The wall charger will work on power points rated from 100 - 240V and 50 - 60Hz so its pretty much universal. The only problem is the pins are straight up and down instead of being on an angle like normal plugs are in Australia. Two options to fix this are, buy a cheap travel adaptor from DS, jaycar electronics or the like. The other option is... use a pair of pliers to bend the pins so they fit into an Australian wall socket! I wanna ask if you did unlock your nexus one? Or it is already unlocked, when you received it? It wasn't locked to any network when I got it, if that's what you mean. Some people also refer to "rooting" the phone as unlocking to... (unlocking the boot loader). So if that's what you meant, then no the boot loader was not unlocked and still isn't. Google is shutting down Nexus One web offer so hurry. Anyway, just to check if you know of any apps that can sms iphone users for free? Like what handcent does for android. Um, to be honest, I didn't even realize that handsent did that. As for I phone, I would doubt it, their pretty locked down from what I've heard. But ya never know. I think you would need to use some sort of instant messenger, or skype. It would be nice if Google voice was available here. But yeah.